Kindly, we are engaged in presenting a wide assortment of Roller Hearth Furnace. This Roller Hearth Furnace is extensively used for all heat treatment processes, for normalizing and for the different annealing treatments of bars, tubes and in many other suitable applications. Our products are highly durable in nature. 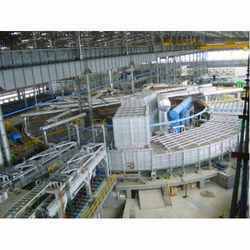 Assisted by rich industrial experience and modern technical knowledge, we are engrossed in providing high quality array of Forging Plant Furnace. 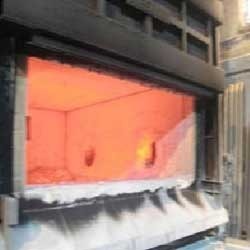 We are emerged in offering premium quality Bogie Heat Furnace. Over the years of dedication, we have been serving our clients with a wide array of Rotary Hearth Furnace for our huge clientele base. This also includes heat treatment furnace in order to stand up to the demands of variegated customers. This furnace is capable of heating non-metallic elements like silicon carbide and super. Can be gas fired or electrically heated. Used majorly for heat treatment applications such as annealing, hardening, tempering and forging as well. The bogie has the capability of moving in and out of the furnace with the charge. Is much similar to the conventional shuttle kiln for the ceramic and brick industries. These type of furnaces are in use for batch type operations where big size charging materials are to be loaded through overhead cranes or forklifts, necessitating the hearth to come out for loading and unloading operations. W.j. Alcock Co. (p). Ltd.
Wesman has a full range of Rotary Hearth type Heat Treatment and Reheating Furnaces up to a capacity of 150 MTPH to offer to the Seamless Steel Pipe, Rail Wheel and Axle manufacturing and Forgings Industries. Mostly billets/blooms are placed horizontally on the hearth. Rotary hearth furnaces for vertical loading of the material can also be offered. Wesman Thermal Engineeering And Processes Pvt. Ltd.
We are engaged in manufacturing products such as rotary heath. Tenova LOI Italimpianti has over 300 rotary hearth furnace references. Design and supply of rotary hearth furnaces are provided for heat treating, bloom reheating in seamless pipe mills, calcining, carbon based DRI production, metal reclamation as well as other applications.